There’s something very serene and peaceful about a paddle by lake kayak. The water laps at the side of the boat. You can watch the wind work its way across the water, and catch the sounds of the birds overhead. You can see to the depths of the blue water – perhaps catch a glimpse of a fish. And you can get some quality time with your family, a captive audience so to speak. I’ve been kayaking a few times with other adults, but I loved taking my eight-year-old son for a paddle on the North Shore of Lake Tahoe. We rented a double kayak at Action Watersports of Tahoe in Incline Village, NV. You can park at the Hyatt and walk over to their hut on the beach. This makes for a great place to start as you can enjoy the beach and Hyatt amenities before or after your paddle. It took us a little while to get our coordination going. To be efficient in a two-man boat you have to get a rhythm and avoid crashing your paddles. We laughed a lot, but made our way towards Hidden Beach on the East Shore, about a thirty-minute rigorous paddle. The reward was a deserted beach, beautiful white sand, and a chilly swim amid the granite boulders. We took our time coming back. My son tired of paddling (what a surprise! ), and I could feel my shoulders start to burn. But we made progress and loved paddling close to shore next to the enormous lakefront estates (another reason to choose Incline). We pulled in a few minutes shy of our two hours, still engrossed in our conversation. Relaxed and hungry, we enjoyed a delicious Hyatt lunch on a lounge chair, right next to the water. A little bit of decadence never hurt anyone. 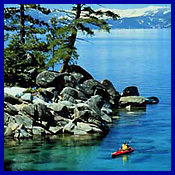 - There are several kayak rental outfits around Lake Tahoe. Look for coupons in local publications. - Start close to a scenic area, you won't cover too much water the first time out. - Try two hours to start. One hour is too short and a half day or more is stretching it with kids. - Plan a paddle where you can stop and take a break at one of Tahoe's pretty beaches. - Go early for best weather conditions. - Wear life vests, kayaks can overturn suddenly, especially when large boats leave a big wake. - If you take a camera, put it in a waterproof bag or plastic bag - Don’t panic if your arms tire, you get used to it! Action Watersports has several locations around the lake: Lakeside Marina, Camp Richardson, Hyatt Incline Village and Meeks Bay. Prices vary – average $20 per hour one man; $30 hr two man boat. action-watersports.com . KayakTahoe is dog friendly (we suggest you wait until you are a bit more experienced before you bring Fido along). Located in Carnelian Bay, just east of Garwoods & Sierra Boat Company. Enjoy a leisurely paddle into the Truckee Marsh or check out the guided tour to Emerald Bay. For the more adventurous Kayak Tahoe offers drop-offs at Baldwin Beach for a paddle to Emerald Bay. Singles are $15 per hour; $25 for two hours; $38 for half day and $60 for full day. Doubles are $28 per hour; $42 per two hours; $55 half day and $80 full day. Rent a Kayak for two hours and the third hour is FREE! The Tahoe Adventure Company now offers Kayak Rentals on the North Shore of Lake Tahoe. Located in the Tahoe Vista Recreation Area at the intersection of North Lake Blvd. (Highway 28) and National Avenue in Tahoe Vista, California ~ North Lake Tahoe. The Tahoe Adventure Company offers single or double sit-on-top kayak rentals from their beach in Tahoe Vista or will deliver to another location. Kayak tours also originate from this location. The Tahoe Adventure Company also offers many tours for first timers or those that are a bit more adventurous. All one-day kayaking tours cover comprehensive paddling instruction, lunch on the beach, as well as a unique perspective on the geology and natural history of the area. All trips are suitable for beginners. Choose from an Introductory Kayak Tour, Sunset Kayaking on Lake Tahoe, Historical West Shore Kayak Tour or Thunderbird Lodge Kayak Tour. Rates and lengths of tour vary. See their website for more details. High Sierra Water Ski School offers kayak rentals at two locations: Sunnyside Restaurant, Lodge & Marina, 1850 West Lake Blvd (2 miles south of Tahoe City) or Homewood High & Dry Marina, 5190 West Lake Blvd. (7 miles south of Tahoe City). Rates: $25 hr; $40 two hours; $10 each additional hour. High Sierra also rents two person kayaks and canoes for those that want to experience the waters of Lake Tahoe at a more relaxing pace. The office is located at Kings Beach State Beach recreation area in Kings Beach. Call for rates and hours.